This is my 100th post on Shruti's Blog! Thank you, all my readers for loving the blog and encouraging me to cook, write and post! 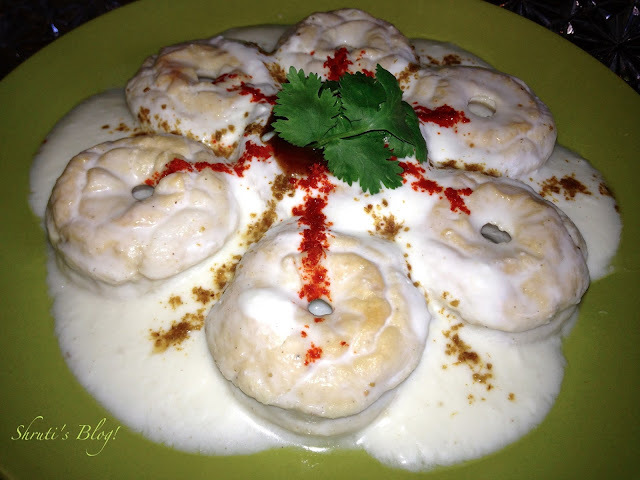 I am happy posting these guilt-free Dahi Wadas or Baked Lentil Dumplings in a Spicy Yoghurt Sauce, in celebration of life and blog! After nearly eight years of being taken for granted and working unconditionally to keep us warm in winter and cool in summer, the central air conditioning in our home has had a (nervous) breakdown in this latest spate of horrendously hot weather in Melbourne. Two sides of the apartment are sheer glass, a style feature we so enjoy, but in the present circumstance they turn our home into a veritable furnace. We have never thought so unkindly of our home, but then, we haven’t hardly thought twice of our amenities either, switching on the air-conditioning, cranking the thermostat up or down, with nary a care. Why haven’t we called the AC repair guys, you will ask. We did! Called up every one of them that service the CBD area from the yellow pages, but the earliest we could get one to come out is next week. Such is the irony of living in a so-called developed economy. Electricity, water and water supply will almost never be interrupted, but you may have to wait for days or weeks before you can get tradespeople to come out to repair stuff. Too hot to cook, too hot to write, too hot to think! Everyone is whingeing and snapping at each other. We spent one night at my brother’s. Borrowed their good old evaporative air cooler. The cat has gone limp and lying directly in the path of the cool air. And I remember lines from an essay I taught Year 10 students for many years, enjoying the teaching and learning from it, discovering new meaning with each successive batch I taught year after year. The essay by Dr. Christian Bernard, the surgeon who performed the world’s first successful heart transplant, was titled “In celebration of being alive”. Bitter about the suffering of little children that he sees around him, and harried by his own family’s travails following an accident, the heart surgeon reflects on his father’s wise belief that suffering ennobles. He sees nothing ennobling in the suffering of little children, but has an epiphany in his children’s ward when he sees the spirited, gleeful romping of a blind child his mate with only one arm. Undeterred by their disabilities and unfettered by sorrow, the kids are having so much fun the sensitive doctor realises a home truth that, "We cannot appreciate light unless we have seen darkness nor can we appreciate warmth unless we have experienced cold!" Almost twenty years later, these words ring true in my years. We were so quick to adapt to the air-conditioning after spending our childhood with ceiling and table fans, then again, these had been introduced into the family only when we were seven or eight years old. Not that we lived in antediluvian times, but the world in those days wasn’t as hot, arid and leafless! Like bad habits, dependence on these luxuries was very quick to be acquired and stick, and we didn’t realise when our wants became our needs. But we weren’t quick enough to adapt to the reverse situation during this great heat siege. these last few days, the thought of entering the hell’s kitchen has been so unbearable. But the family has to be fed. Yoghurt did a marvelous job of standing in on all meals and deserved to be a little spiced up. Dahi wada seemed to a good solution, and a baked dahi wada was perfect, as I didn’t have to stand in the kitchen frying! Plus the added bonus was it was guilt free, with only about 3 ml oil per wada! Soak the dal in plenty of cold water and add a pinch of baking soda to it. I usually don’t add soda, but since I was baking the wadas, I thought this might assist. After about 2 hours, grind the dal with all the ingredients for the wada, except the oil. Grind into a thick paste and adjust the tastes. Add the oil and beat it with a whisk until the batter is light and fluffy, say about 8-10 minutes. Bake the wadas in a pre-heated oven in muffin or doughnut trays at 220C for about 20 minutes or until done. While the wadas are baking, mix all the ingredients for the yoghurt sauce and beat till smooth. Adjust the tastes and keep a little sauce aside. In the remaining sauce add a little water. It’s better to keep the sauce a little runny, as it gets better absorbed into the wadas. When the wadas are done, allow them to cool slightly and then dunk them into the sauce. Chill the wadas in the yoghurt sauce for at least an hour or so and check if they have got soaked well. Pour the thick sauce you have kept aside on the top and garnish with coriander and sweet date and tamarind chutney. The family has now declared that they will not see me ever slogging over the stove, frying wadas, for it’s always going to be baked wadas at home. The best part about baking is these wadas had about 3 ml oil each! And you don’t have to be too worried about adding as little water as possible while grinding the dal – for shaping is not a problem at all – not with a doughnut tray! excellent !! Now we can eat dahi wadas without guilt. 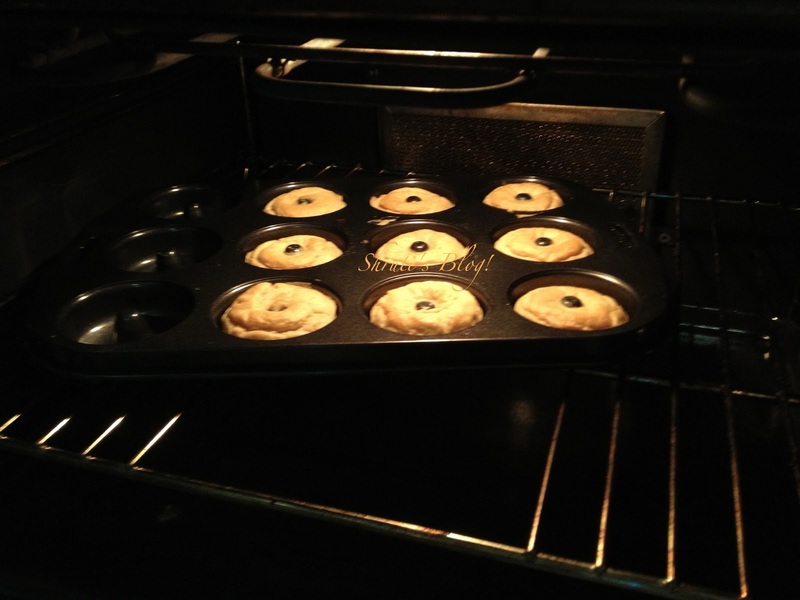 In this recipe, is it the soda bi-carb or baking powder? Shruti, they turned out awesome! Thanks so much for this BRILLIANT idea! I went on a Research Expedition - literally. Baked 1/3rd batter, cooked 1/3rd batter and fried 1/3rd batter. Made Hubby dearest the guinea pig. Will post the details on my blog with pics. 1. Listen to Shruti - keep batter as thick as you can while grinding the daal. 3. Listen to Shruti - soak the wadas straight away in yogurt. No need to soak in water first like we do with regular wadas. 4. Let the wadas cool completely before soaking them in yogurt. Wow! What an enterprising lady you are Anu! Bravo!